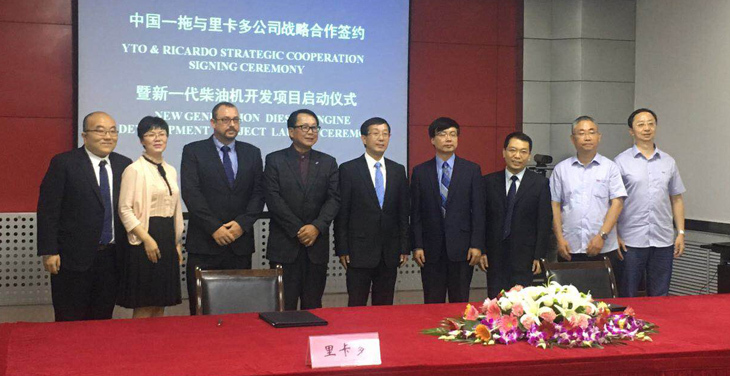 The project announced today will see Ricardo and YTO Group collaborate on a clean sheet design for a new four and six-cylinder diesel engine family. The new product will feature some of the latest combustions and emissions reduction technologies – including the highly successful Ricardo TVCS – with the aim of delivering best-in-class performance and fuel consumption. The all-new engine will replace the existing LR105 series, a product originally designed by Ricardo as long ago as 1980 – and which remains one of the most successful agricultural vehicle engines in China, with annual production volumes exceeding 100,000. With a market launch early in the 2020s, versions of the new design will power YTO products including tractors, harvesters, and many other off-highway machines. In addition to supporting with the design of both four- and six-cylinder versions of the new engine, Ricardo will also lead calibration and mechanical development testing based at YTO’s engineering facilities in China.